Big data offer a wealth of research opportunities across the scholarly disciplines. Little data similarly offer depth of investigation within and between fields. However, having the right data is usually better than having more data. Enthusiasm for data-driven research is obscuring the complexity and diversity of data in scholarship and the challenges for stewardship. Data practices are local, varying from field to field, individual to individual, and country to country. Inside the black box of data is a plethora of research, technology, and policy issues. Data are best understood as representations of observations, objects, or other entities used as evidence of phenomena for the purposes of research or scholarship. Rarely do they stand alone, separable from software, protocols, lab and field conditions, and other context. Concerns for data sharing and open access raise questions about what data to keep, what to share, when, how, and with whom. Open data is sometimes viewed simply as releasing data without fees. In research contexts, open data may pose complex issues of licensing, ownership, responsibility, standards, interoperability, and legal harmonization. Agreements on these and many other aspects of data are required, both to share and to reuse them. To scholars, data can be assets, liabilities, or both. To librarians, data also are scholarly products to curate for future users. However, data are much more difficult to manage than publications. 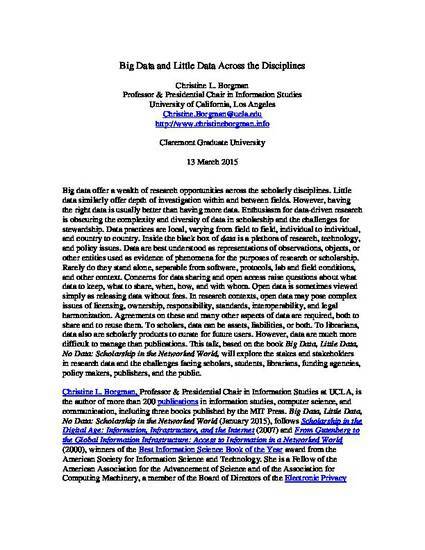 This talk, based on the book Big Data, Little Data, No Data: Scholarship in the Networked World, will explore the stakes and stakeholders in research data and the challenges facing scholars, students, librarians, funding agencies, policy makers, publishers, and the public.